O God, who in your providence raised up Pope Saint Pius the Fifth in your Church that the faith might be safeguarded and more fitting worship be offered to you, grant, through his intercession, that we may participate in your mysteries with lively faith and fruitful charity. Through our Lord Jesus Christ, your Son, who lives and reigns with you in the unity of the Holy Spirit, one God, for ever and ever. Pope St. Pius V and Quo Primum | Jeffrey A. Mirus Ph.D.
St. Pius V, who was born in 1504, joined the Dominicans at the age of fourteen; he was sixty-two when he was elected Pope. His reign, though short, was one of the most fruitful of the sixteenth century. To Protestantism, which had proclaimed the Reformation, St. Pius replied by applying the decrees of the Council of Trent for the reform of the Church. He played a great part in the return of the clergy to ecclesiastical discipline. Against Islam, which threatened the West, he succeeded in forming a coalition of Christian forces: and by public prayers, organized everywhere at his request, he was instrumental in obtaining the decisive victory of Lepanto in 1571. He died the following year on May 1. We also owe to St. Pius the reformation of the liturgical books of the Roman rite. The Church in Canada celebrates the feast of Blessed Marie of the Incarnation. Commanded by a vision to become a missionary in Canada, in 1639 Marie Guyart de Incarnation arrived in what would become Quebec City. By 1642, Marie had built a convent, establishing the first Ursuline school in New France. Her talents as a business administrator enabled the convent to survive against enormous financial odds. Marie learned Algonkin and Iroquois, and wrote dictionaries for both languages. Her 1654 Relation ranks her among the greatest mystics of the Catholic Church. Regularly consulted on political and economic matters. According to the 1962 Missal of St. John XXIII the Extraordinary Form of the Roman Rite, today is the feast of St. Catherine of Siena. Her feast in the Ordinary Form of the Roman Rite is celebrated on April 29. St. Pius V's feast in the extraordinary form is celebrated on May 5. In December of 1565, Pope Pius IV died. His one monumental achievement was the resumption and successful conclusion of the Council of Trent. The man chosen to succeed Pius IV and upon whose shoulders rested the responsibility for carrying out the decrees of the council was Michael Ghislieri, a Dominican friar. It was the late pontiff's nephew St. Charles Borromeo who had been the driving force in the election of the new pope, for he recognized that a remarkable leader would be needed if the decrees of the council were to bear fruit. Michael Ghislieri was a poor shepherd boy who entered the Dominicans at the age of fourteen, became a lecturer in philosophy and theology at Pavia, and very early became involved in the reform movement in the Church. His reforming labors brought him to the attention of other members of the reform movement, and he was given important positions in Como, Bergamo, and Rome. In 1556, he was consecrated bishop of Sutri and Nepi, and then to the diocese of Mondevi, lately ravaged by war. In a very short time, the diocese was flourishing and prosperous. His views on reform were often asked by the Holy Father, and he was noted for his boldness in expressing his views. His holiness and austerity of life were notable, and he succeeded in bringing simplicity even into the papal household. He refused to wear the flowing garments of previous popes and insisted upon wearing his white Dominican habit even as head of the Church. To this day, the pope wears white, a custom begun by this Dominican pontiff. 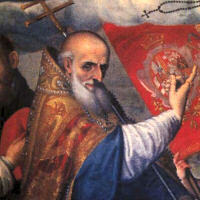 The announced intention of St. Pius V was the carrying out of the decrees of the Council of Trent. He insisted that bishops reside in their diocese under pain of losing their revenues; he made a systematic reform of religious orders, established seminaries, held diocesan synods, and reformed the Breviary and Missal. He brought unity into divine worship, published catechisms, ordered a revision of the Latin Vulgate and revitalized the study of theology and canon law. During his pontificate, the Turks were definitively defeated at the battle of Lepanto, due, it was said, to the prayers of the pope. Pius V died in 1572, at the age of sixty-eight, deeply grieved by the troubles besieging the whole Church. He was canonized by Pope Clement XI in 1712. Read about the Council of Trent. Read the decrees issued by the Council or read the Canons on Justification with a summary of their teachings. Her name was originally Marie Guyard. She was married in her youth and bore a son; when her son was 12 years old, her husband died and she decided to enter the Ursuline order. At her entreaty, the authorities gave her and another nun permission to go to New France to work among the Native Americans. In 1639 she arrived in Quebec, where she was soon head of an Ursuline convent. She administered her house with great success and worked among the Native Americans with notable results. Her letters are valuable sources of French Canadian history. She wrote devotional works and catechisms, not only in French but in Native American languages. She died of hepatitis in Quebec, Canada. — See A. Repplier, Mère Marie of the Ursulines (1931). Learn about the history of New France and of the native Americans. Assist the Indian missions by your prayers and donations.